Discussion in 'The ASSEMblergames Marketplace' started by beharius, Apr 1, 2014. Buongiorno beharius! Please clear some private messages or i can't reply you, your inbox is full! The result is always the same: no picture. I've tested the setup by plugging the DC with composite to the Kenzei and it works. So something on the VGA part is failing. Tried my custom VGA cable AND with Hanzo, but same result. Am I missing a setting on the Framemeister, Kenzei or anything else? Try to change the sync_level in Framemeister. Most consoles run with a sync level of 9, but DC needs 16 or something like this, if I remember right. I have only one left ... PMed. how do I order one`? geekmiki this is the exact same set up and issues that I am having. Did you ever get it figured out? Do you have to run a Hanzo with a Kenzei no matter what? 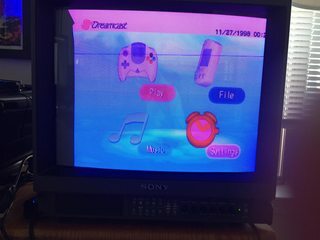 Hey, I just received my Kenzei but need a bit of help configuring it with my PVM. As you can see from the photo below, the picture is a slight tinge of red/pink, and there seems to be a slight sync issue. 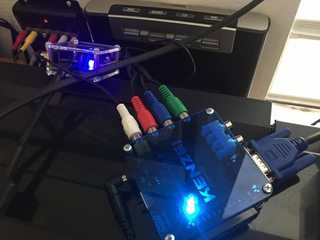 I know the Kenzei has some jumper settings for the SCART, but that shouldn't matter with the RCA connections, right? Let me know if you need anymore photos, info. Am I missing something?